Postwar periods are often the most opportunistic times for fads to develop as people are more apt to relax and find amusement with simple things. In the time following World War II, people across the United States fell in love with a toy developed by Richard T. James — the Slinky™. 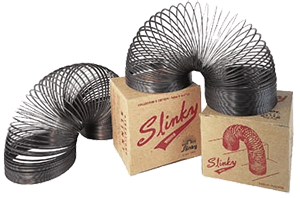 The Slinky™ originated from James’ experience as a shipbuilder when a coil spring he was working with fell off of a shelf and began to gyrate and make slithering movements as it moved across the floor. 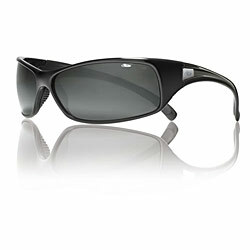 The spring appealed to his curiosity and he devised a plan to create a toy out of it. He got a chance to try the toy out on a bedridden boy. After the boy was delighted, James set forth producing and marketing the toy. He went from store to store and was rejected by all of them until he found a small shop that agreed to take on four dozen units on consignment. Before James got home, the toys had sold out and the shopkeeper begged for several more. James and his wife set out producing and selling the Slinky™ full-time and over the Christmas season, the toy was a major hit and they had difficulty meeting the overwhelming demand for it. The Slinky™ was made of an 87 foot piece of wire, three inches in diameter and two inches high when flattened. It could, however, be mad to perform numerous tricks, the most famous of which was being turned end over end, seemingly walking down stairs. James battled through patent litigation disputes, steel shortages, warehouse fires and problems with local Philadelphia inspection officials to sell an estimated 14 million units in a ten year period – and the Slinky™ continues to be a best seller even today.